What do you do when the drain line under your home’s concrete slab breaks, water begins to overflow from the toilet or sink, and your home is damaged? Normally, you would make an insurance claim, and you would be covered to access the drain line to fix the break. Then you would receive coverage for putting everything back to the way it was before the loss. But what State Farm tried to do to one of their customers, and is doing to all of its customers, is far from normal. They tried to take that access away. Not only did they try to take it away, but they did so by deceiving the homeowner, telling them they would be giving them additional coverage, when in fact they had given them less. Wheeler, DiUlio, & Barnabei knew this was wrong, and decided to do something about it. In the case of Aguiar v. State Farm, docket number 161001169 filed in Philadelphia County, PA, State Farm had denied access coverage to repair the broken drain line that was the cause of water damage to the Plaintiff’s bathroom. State Farm had admitted there was a break in the line, and wrote a letter confirming that the break was the cause of the overflow, however they refused to pay to access this broken line for repair. This refusal was based on an endorsement that was added to the Aguiars’ policy, without giving them any choice in the matter. This endorsement, FE-2340 AMENDATORY ENDORSEMENT, significantly changed the access coverage. To help explain, we need to point out some key language in this endorsement. As you can see, the new language unquestionably reduces coverage for the Plaintiff. Let’s unpack this a little. 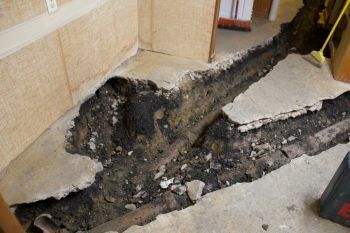 Under the old language, State Farm would owe for any and all access necessary to repair the plumbing system, including the cost to access the drain line that caused the water to overflow. Now, State Farm is trying to get away with paying to access only where the water escaped (e.g. the toilet or sink) and therefore was not paying to access the broken pipe under the slab, the cause of the overflow. Imagine you are a homeowner who has received an endorsement that claims it is not changing coverage but, in fact, is giving you additional coverage. Only once you suffer a loss do you discover that your coverage was actually reduced, and you had been deceived by your insurer. That is exactly what happened to the Aguiars, and why Wheeler, DiUlio, & Barnabei sued State Farm for breach of contract, bad faith damages, and for a breach of the Unfair Trade Practices and Consumer Protection Law. The case went to trial in front of the Honorable Judge D. Webster Keogh, and the trial court not only found in favor of the Plaintiffs, but also awarded damages consistent with Plaintiff’s Attorney’s fees. Attorney’s fees cannot be awarded as part of a standard breach of contract claim, but under Plaintiff’s Bad Faith claim that was filed under 42 Pa.C.S. Section 8371, attorney’s fees are owed if the Insurance Company, i.e. State Farm, acted in bad faith. These Bad Faith damages including attorney’s fees are awarded when the Court finds that the insurance company acted unreasonably, knew they were doing so, and still chose to continue with their actions. In this case, the Court not only awarded the Plaintiff’s breach of contract damages, but also awarded the amount of Attorney’s fees being demanded by Plaintiff under the Bad Faith claim. Plaintiff fought tooth and nail claiming that State Farm knew they were acting unreasonably and yet still continued to do so in the hopes of saving a buck and leaving the homeowner to address the damages to their home themselves. If you have been denied access to fix a plumbing line by State Farm, contact us right away. We will do all we can to help.